Kathmandu [Nepal], April 4 (ANI): Renowned Indian Sufi and playback singer Kavita Seth after mesmerising the Dhaka audience, is back to enthrall the music lovers in Nepal with some soulful tracks. 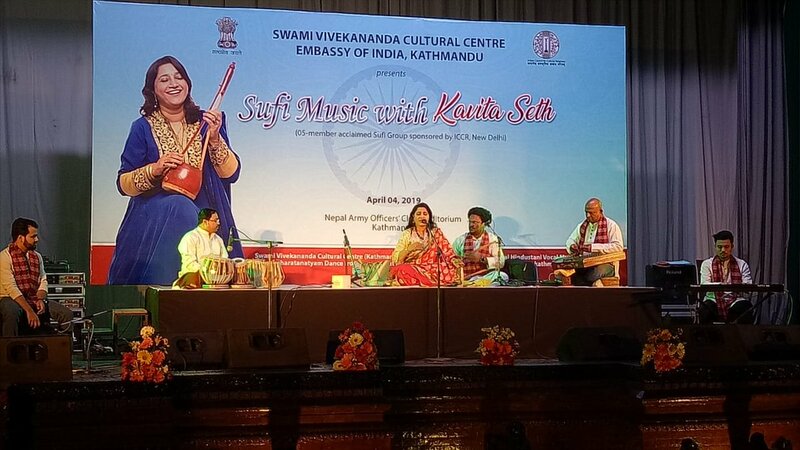 The Swami Vivekananda Cultural Centre, Embassy of India in Kathmandu organised a Sufi music night by Kavita on Thursday at the auditorium of Nepal Army Officer’s Club, Kathmandu. The Embassy of India, Kathmandu also shared the news on their Twitter handle. 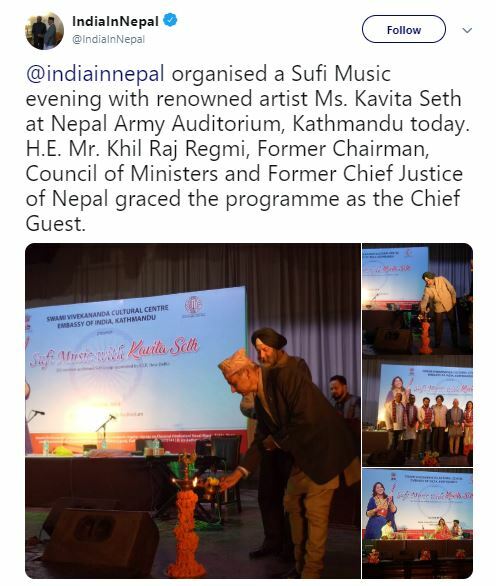 “@indiainnepal organised a Sufi Music evening with renowned artist Ms. Kavita Seth at Nepal Army Auditorium, Kathmandu today. H.E. Mr. Khil Raj Regmi, Former Chairman, Council of Ministers and Former Chief Justice of Nepal graced the programme as the Chief Guest,” the tweet read. Kavita is popularly known as a playback singer in Hindi cinema, as well as a performer of Ghazals and Sufi music. She has also formed her musical group called ‘Karwaan Group’, which is a band of Sufi musicians. She received her musical training in Hindustani classical music under ND Sharma of Gwalior Gharana, Vinod from Gandharva Mahavidyalaya, and Ustad Iqbal Ahmed Khan of the Delhi Gharana. Kavita is famous for her Sufi-style singing. Over the years she has performed at various live shows in London, Birmingham, Scotland, Berlin, Oslo and Stockholm and several places across India. She won the Filmfare Award for Best Female Playback Singer in 2010 for her classical Sufi rendition ‘Gunja Sa Koi Iktara’ for the film ‘Wake Up Sid’. Apart from, ‘Wake Up Sid’, the singer has also rendered songs like ‘Mora Piya’ from ‘Rajneeti’, ‘Tumhi Ho Bandhu’ from ‘Cocktail’ and ‘Jeetein Hain Chal’ from ‘Neerja’.